A: From Friday 27 April to Tuesday 01 May. Doors open each day at 8am and close at 4pm. Q: Parking. Will there be dedicated parking for those attending the sale? A: No. Parking is on the street, with limited spots. We recommend carpooling or Ubering to the sale. If you bring your car, please be considerate of those working in the area when parking. Please do not park anyone in or obstruct the entrances to the businesses in the area. Q: Can I use my Fanatics card and Fanatics Coupons at the sale? – Download our EB App on the App Store or Google Play now and load your Fanatics card onto the App to ensure that your card is always with you! 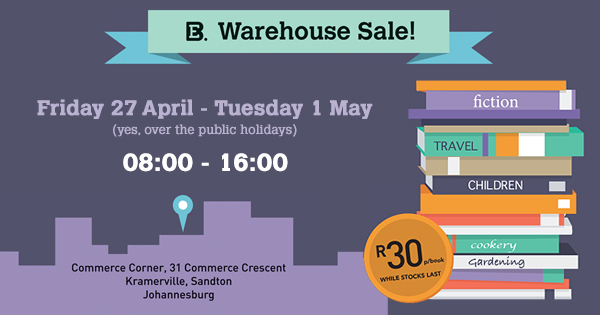 Q: Will every book on the sale be R30? Even if it is a Hardcover book? A: Yes! Absolutely everything on the sale is priced at R30. A: We only have one warehouse currently which is based at our Head Office in Johannesburg. Q. I can’t make it on the Friday, will there still be good books left by Tuesday?